Many people love the convenience of simply running to the grocery store to buy food. The convenience is attractive. But it cannot compare with growing your own food in your home garden. I too used to love food from the grocery store until I heard the first food recall. A food recall due to Escherichia coli contamination of spinach is a good example. Starting a home garden where you grow your own food is the best solution to many health issues. 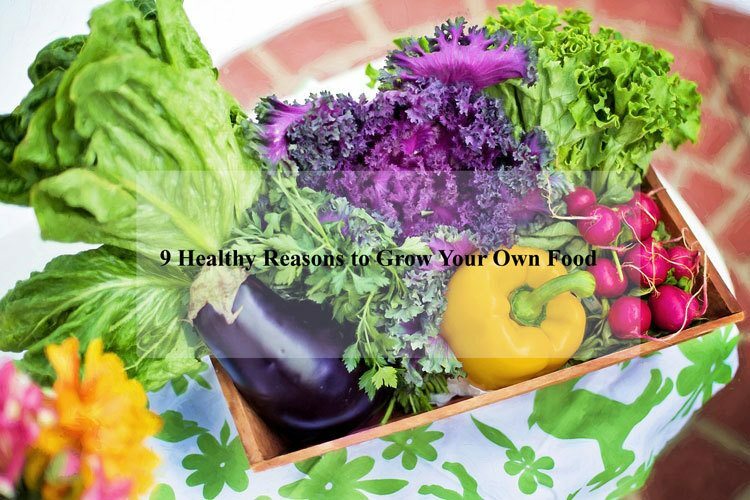 We have compiled a descriptive list of 9 healthy reasons to grow your own food. You will grow in experience tending to your garden and growing your own food. Thus you will learn to eat in season when nutrients and flavors are at peak. Fresh vegetables and fruits from the garden have natural flavors. Therefore, you will not need any oils, sweeteners and other additives to improve flavor. Such additives are culprits for numerous health problems. You will harvest vegetables and fruits that ripen in the home garden. And consume them fresh. This is in contrast to grocery store fruits and vegetables. Usually, they are harvested before maturity and left to mature on the shelves. This interferes with flavor and nutrient content. It is clear that nutritional value of foods reduces over time. The foods bought from grocery stores are commercially grown. Large-scale farmers usually use chemicals. These are pesticides, fungicides and herbicides to control plant pests and diseases. Besides, they use artificial fertilizers to improve soil fertility. On the contrary, you control the growing environment of your home garden. You can easily adopt organic ways of pest and disease control and soil improvement. Consider the bulletin of The Environmental Working Group dubbed “Dirty Dozen” list. It lists top 12 USDA-tested produce containing highest loads of pesticides every year. The 2017 edition listed tomatoes, spinach, celery, potatoes, and pepper as the culprits. Luckily, these are some of the easiest and most productive vegetables you can grow at home. Money is hard to come. If you can find a way to make savings then it is a great thing to pursue. The grocery bill is always larger than most other bills. It is a serious cause of stress and depression. You can shrink the grocery bill a lot by growing the common vegetables. You would otherwise buy from grocery stores at large cost. All you need is a packet of seeds. You will spend less than a dollar for enough amounts of seeds to give you a bounty season’s harvest. Certain seed varieties such as heirloom, non-hybrid can be preserved. Later, use them for the next planting season. Simply select seeds from the best producers. Dry them and store them for next season use. Growing food in your backyard is the surest way to know the source of your food. It’s amazing what people can do to get money. Most large-scale commercial farmers rarely care about your health. All they want is your money. Listening to news about food borne or food-related illnesses is disheartening. In the US alone, up to 48 million people suffer from food-borne illnesses every year according to FDA. Of these, as many as 130,000 people get hospitalized while about 3000 of them die. You can avoid being a victim of food poisoning by producing your own food. The commonest food borne illness outbreaks are caused by Salmonella and Listeria. If you want a healthy and vibrant family, start growing your own food. Young children need a well-balanced diet full of micro-nutrients and macro-nutrients. Fresh vegetables are rich in top-quality vitamins that will support healthy. Balanced diet and nutrients help in the speedy growth of your entire family. Children who eat homegrown vegetables are twice or more likely to prefer them. This is according to report. Liking homegrown vegetables is a good step to achieving holistic health. All family members will be involved with tending to the garden. For that reason, your children will grow into responsible citizens. Global warming is today the biggest threat to the survival of mankind. Adverse human activity is to blame for this catastrophic outcome. Starting a garden in your backyard will greatly reduce your environmental impact. Growing your garden vegetables and fruits organically will spare the environment. It will cut the burden of water and air pollution. Producing your own organic food will also reduce your need for fossil fuel. Imagine if everyone was to produce their own foods. There would be no need for planes, farm machinery and trucks that use fossil fuel. This would reduce emissions to our atmosphere to cause global warming. If you plant a garden in your backyard, you will breathe fresh air. This will reduce risks for many diseases. Obesity is a major cause of morbidity and mortality in our society. The major contributing factor to these problems is a sedentary lifestyle. Growing your own garden is the greatest way to stay active by getting outdoor exercises. Consider gardening practices and techniques such as tilling, planting, watering, weeding and harvesting. They add useful physical activity to your day. Working outdoors exposes you to good quality sunshine and fresh air regularly. And regular physical activity helps you feel better. It also improves your well-being by relieving depression and boosting your energy. The second highest commonest components of landfills are an organic waste (UNEP). Organic waste is also the vastest source of methane emissions. An estimated 30 percent of food supply goes to waste. This accounts for more than 20lbs of food per person each month. Any vegetables and fruits you produce from your own garden will seldom go to waste. You will consume it all and preserve any excess. Pieces trimmed or chopped off are not wasted either. You can use them to feed hens and other livestock. Alternatively, you can add them to compost bin or hip to form organic plant food. The World Health Organization (WHO) defines food security as being achieved when “all people at all times have access to safe, sufficient and nutritious food to maintain active and healthy life”. The best way to guarantee food security for you and your family is to grow your own garden. Your garden will provide you with direct access to food that you can harvest, process and feed to your family. This is possible during the growing period. When the growing period is over, you can use the foods you preserved to feed your family. Thus, you need to learn how to preserve food properly to last longer. There you have it. These are the healthy reasons to grow your own food. Many people wish to go organic. However, obtaining organic food from grocery stores may prove very costly. And you cannot always be sure it is organic. The surest way is to plant your own garden and enjoy unlimited access to healthy, delicious and rich vegetables. The milestone here is to start the garden. Once you begin, it will surprise you just how much you can benefit from the organic produce of your garden.